It is not very often that I come across an alchemical emblem quite unknown to me, but yesterday I found this item. It appears as the frontispiece to the 1668, Paris, edition of P.M. Respour Rares experiences sur l'esprit mineral, pour la preparation et transmutation des corps metaliques. Où est enseigné la maniere de faire les Agens necessaires, qui ont esté jusques aujourd' huy inconnus & cachez au Public. The title translates as "Rare experiments on the mineral spirit, for the preparation and transformation of the metallic bodies. Wherein is taught the way to make the necessary agent, which has been until today unknown and hidden from the public." At the four corners of the engraving we see the symbols for four of the planetary metals - Saturn, Jupiter, Venus and Mars. 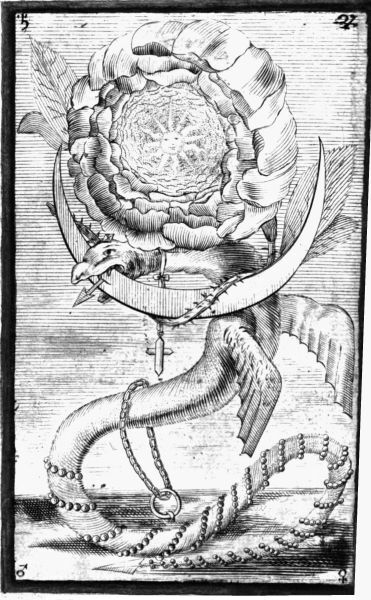 The emblem presents us with a strange winged dragon which has been held down to the ground by a chain fixed to a ring. The dragon manages to raise itself and bites at the crescent Moon. Set above the Lunar crescent and atop the neck of the dragon is a large rose which has the Sun at its centre. Wound around the tail of the dragon is what appears to be a string of pearls or gems, while hanging from its neck a ribbon is tied with a pendant seemingly composed of two gems forming a cross. We can surmise that the winged dragon is Mercury (the one planetary metal not explicitly depicted here). This mercurial dragon contains in itself the much valued treasure of the gems and pearls. It is, however, tied to the earth and restricted. One would have to read the book in order to decide as to whether this tying down of Mercury was the key to the alchemical work, or if the transmutation was here being held back, and the role of the alchemist was to free this dragon.